A small bathroom might seem like an obstacle you can’t overcome. But it doesn’t have to be. Organization is key in any small space, and making every element as functional as possible is the goal. Here are a few of our favorite creative ways to maximize every possible inch of space in your small bathroom. We love the idea of using shower caddies to really maximize the storage potential of a small, under sink cabinet. The caddies are naturally the perfect size to hold your products and easily double your storage potential. It’s important your shower caddy has a flat bottom so it will stand. 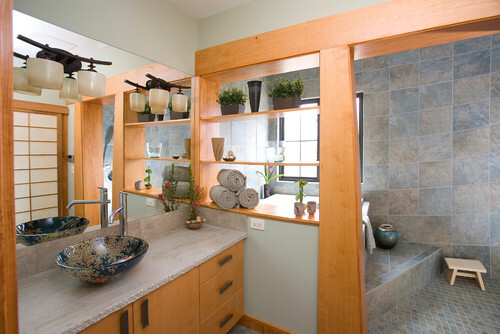 While not possible to create in every bathroom, recessed built-ins can save a tremendous amount of space. This bathroom mirror that doubles as a cabinet is a brilliant way to create a lot of excess storage space in a small area. Go to Shanty 2 Chic to see a complete tutorial on how to create this awesome DIY yourself! Prestige Marble & Granite is happy to answer any questions you may have about your bathroom, regardless of size, and what will work best for your personal style and needs. We are here to help you with a vast selection of unique, exotic and rare natural stones from around the world. Our knowledgeable staff will guide you through selection, layout, design and installation. We welcome homeowners, designers, and contractors to browse our showroom any time! Your bathroom is where you spend a lot of intimate time in your home. It’s where you relax in the tub after a hard day, where you bathe your children, where you brush your teeth. And you deserve to feel good in there. 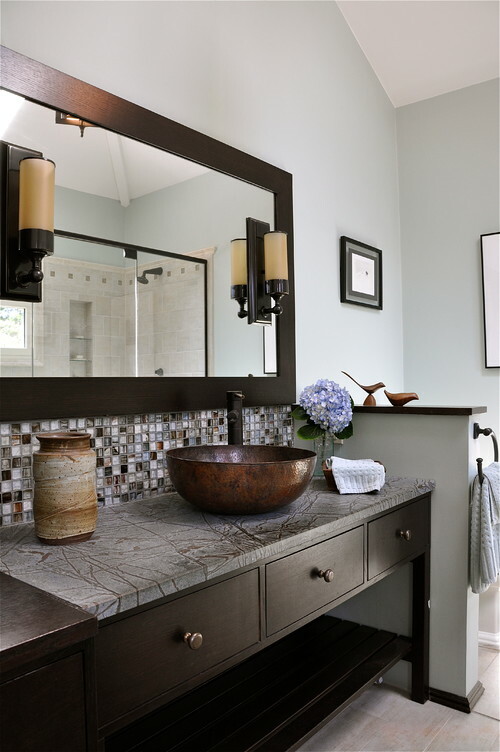 Whether you want to do a full bathroom renovation, or are really just interested in a smaller project, there are so many ways to update your bathroom to help turn it into the space of your dreams. Here are a few of our favorite bathroom trends looking toward 2018. We’re not talking about a bouquet of flowers on the counter. Shower plants started trending in 2017 and don’t show any signs of slowing down. This is probably the most simple way to update and brighten up your space. The only limit here is your imagination; it’s all about having real, live plants in your bathroom. And while you can do whatever you want, the look tends to be more about greenery than flowers. The black and white color combination is classic and will never really go out of style. Regardless, the color scheme is seriously trending upward for 2018. Doing a bathroom in all black & white can instantly create either a vintage or modern feeling. The two toned look below manages to blend the two in a way that is very 2018. The round mirror and gold accents complement the trendy aesthetic quite nicely. Once thought to be a permanent reminder of the 1980s, gold and brass fixtures are making a huge comeback. Trends really are cyclical and if you wait long enough, it seems true that everything comes back in fashion. It’s important to note that the brass and gold fixtures of today are different than your childhood memories of the finish. Today’s brass is a little more understated, a little less shiny than your parent’s was. 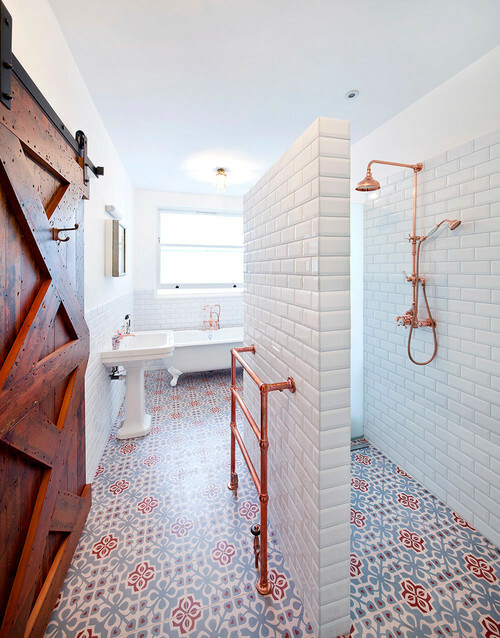 Also called mermaid tile, this look, as with all things mermaid, is trending hard right now. This versatile look can be placed anywhere you’d use tile, but we are really loving it for the bathroom. It adds a whimsical touch wherever, and makes for a great accent wall or shower tile. 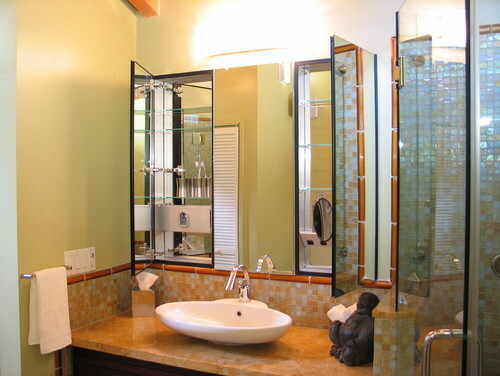 One of the easier ways to quickly update your space is with a round vanity mirror. Designers are obsessed with the shape and it almost instantly gives your bathroom a current feel. Regardless of how you choose to style your bathroom, Prestige Marble & Granite is here to help you with a vast selection of unique, exotic and rare natural stones from around the world. Our knowledgeable staff will guide you through selection, layout, design and installation. We welcome homeowners, designers, and contractors to browse our showroom any time! 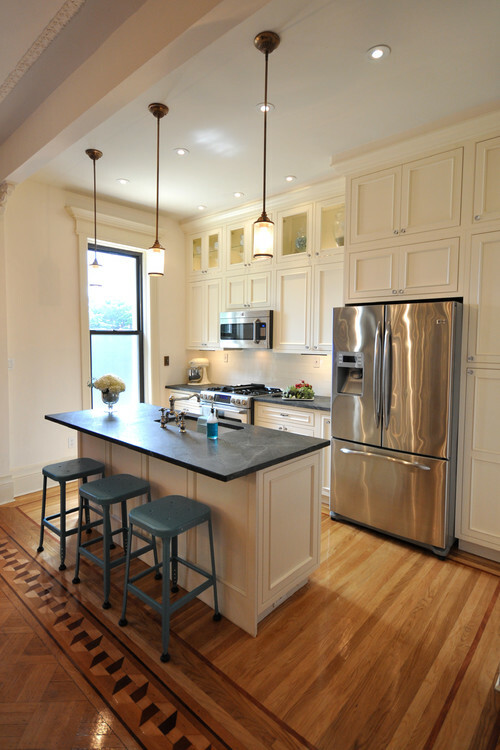 Countertop choice is a huge part of any home design or renovation process. Homeowners spend a lot of time deciding exactly which slab makes the perfect statement for their space. Equally, if not even more important than choosing the right slab, is choosing the right fabricator. How is this possible? The right fabricator will be able to help you choose the right material and slab for your needs. They will be able to explain proper maintenance to insure your counters stay beautiful. While this seems like an obvious part of the job, many fabricators simply don’t take the time or have the knowledge. Founded by Aaron Cook, Prestige Marble & Granite has over 15 years experience in fabricating the highest quality natural stone countertops, earning the company a fabulous reputation as the premier marble and granite business in the region. There are several different things to consider when choosing your fabricator, some more obvious than others. Here are some important questions to ask to ensure you are completely happy with your final choice, and ultimately your countertops! What kind of Certifications does the fabricator have? An established and professional fabricator will be certified. It’s as simple as that. Fabrication and installation certification programs establish industry-wide standards for training and provide measurable proof of knowledge about both the process and products. Prestige Marble & Granite is a member of the Marble Institute of America, which is an instrumental force in setting the standards of quality for stone fabrication and installation. Prestige is also a member of the Home Builder’s Association of Middle Tennessee and the Stone Fabricators Alliance. What options do they offer? Countertops today are made from a wide range of different materials. Are you looking for something that will need to stand up to daily use or are you more interested in creating a specific look? An ideal fabricator will be able to help you choose the best option for your usage, budget, and aesthetic desire. They will be experienced with multiple materials and offers a wide array of choices: granite, marble, quartz, etc. Also, it’s important to be aware of the fact that no two pieces of stone are exactly the same. For that reason its important to find out if you will be able to choose your actual slab, or have to make your decision based on a small sample. What kind of equipment do they use? And do they have in-house installation teams? Top professional fabricators throughout the U.S. use the latest in digital stone cutting technology. This is important when simple mistakes can be costly, cause delays, and negatively affect the final look of your beautiful counters. At Prestige we use state-of-the-art CNC stone cutting machines, routers, and digital templating for quality fabrication and on-time delivery. With digital templating, we can account for the undulation of your wall and ensure the counters match up perfectly. From your vision to computerized CAD drawing to installation of your countertop, your project will receive state-of-the-art craftsmanship and the attention to detail it deserves. We also never use subcontractors and invite you to come see how we operate anytime! This is our CNC saw, the GMM Intra. The Intra allows us to either program on the floor or import a CAD drawing. The Intra can cut parallel, perpendicular and diagonal arcs and circumferences. This machine allows Prestige to cut a wide range of materials quickly and with absolute precision. The Luna 740S is an automatic edge polisher which has been specifically designed to produce straight, slanted , bullnose, and a variety of other edges. This machine is capable of profiling granite, marble, and engineered stones quickly and efficiently. The fact that we at Prestige are completely involved in the entire process, from design to fabrication to installation, helps ensure your counter tops turn out exactly as you imagine. Do they provide references? Can you see examples of their finished projects? A reputable fabricator will be able to provide references of recent projects. If you can visit one of their job sites and/or showroom, that’s also highly recommended. This allows you to ensure the quality of their finished work meets your standards. This requires a bit of extra research and work on your part, but will absolutely help provide peace of mind about such a big investment into your home. Do they provide a warranty on their work? When making any kind of large purchase it’s nice to know the company you are working with will stand behind their work. At Prestige we offer a lifetime warranty on all stone and sinks. We are passionate about making your installation a success and are dedicated to the level of customer service required to ensure your happiness for the lifetime of your counters. Prestige’s commitment to customer satisfaction has earned us an A+ rating from the Better Business Bureau. Whatever project you can dream up, Prestige Marble & Granite is here to help you with a vast selection of unique, exotic and rare natural stones from around the world. Our knowledgeable staff will guide you through selection, layout, design, fabrication, and installation. We welcome homeowners, designers, and contractors to browse our showroom and bring their ideas and questions with them anytime! The bathroom is the space where most of us start and end our days. It’s also the most private room in the house and the place to relax and get away from the stress and pressures of work and every day life. While it may seem that the bathroom is not the most fashionable space in your home, doesn’t this make it one of the most important rooms in the house? Why not turn your bathing space into a place of style and beauty with these five brilliant bathroom design trends. 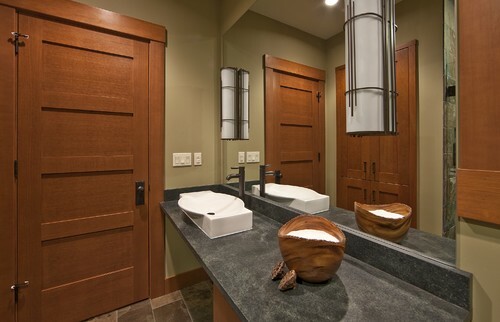 This year will be marked by a emphasis on organic and natural elements when it comes to a bathroom design. Natural materials will not only add character and warmth to your room, but they’ll also help to soften the sleek lines of modern toilets, tubs, and sinks. Materials like wood and naturals tone will add organic coziness to clean colors and simple lines. While floating vanities have been popular in Europe for some time now, they are just becoming trendy in the US. The floating vanity creates a sense of space and openness (great for small bathrooms), but they have practical advantages as well. They can be installed at almost about any height, which is great if you find standard height vanities either too tall or too short. Also, the open area underneath makes for easy cleaning. The look is great for both traditional or modern designs. The metallics trend, which has been strong in other areas of the home, has finally made its way into the bathroom, with copper, brass, and rose gold making a big splash in bathroom design. 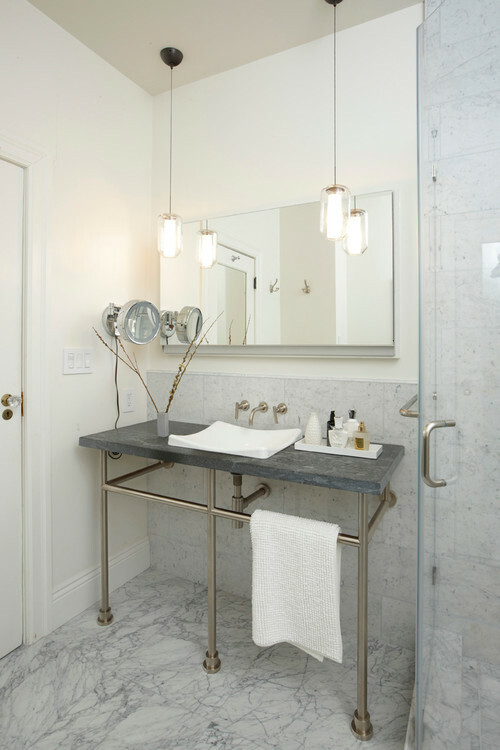 Look out for faucets, mirror frames and towel bars in these soft metal tones that will add warmth to even the most contemporary design scheme. This hot new trend includes a shower space and freestanding tub in their own glass enclosure separate from the sink and toilet areas. Opting for a complete wetroom will give your bathroom a glamorous, spa-like feel, but it’s important to work with professional designers and architects on a project of this scope. When it comes to adding organic elements to your design, Prestige Marble & Granite is here to help you with a vast selection of unique, exotic and rare natural stones from around the world. Our knowledgeable staff will guide you through selection, layout, design and installation. We welcome homeowners, designers, and contractors to browse our showroom any time! Fantasy Soapstone from Brazil is a beautiful, soft blue-gray with dramatic quartz veining. Do you remember your high school chemistry class? If so, you might recall the black countertops the Bunsen burners sat on. 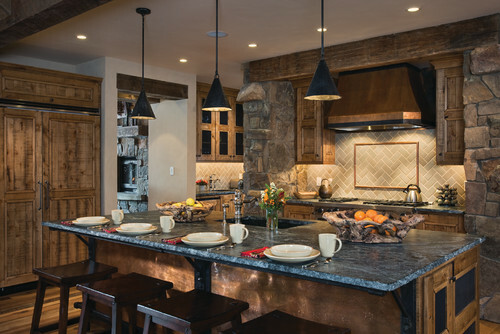 Those countertops are made of soapstone, a metamorphic rock that consists of talc, steatite, magnesite, quartz, and other magnesium rich minerals. 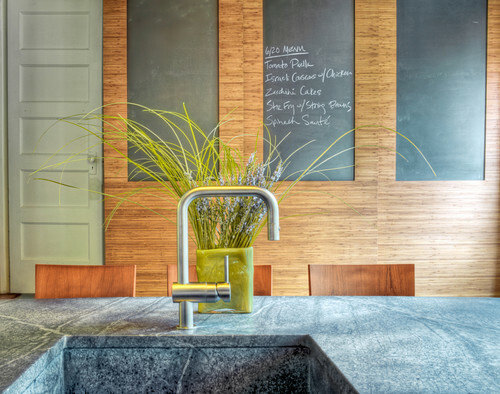 Soapstone is the countertop material of choice for chemistry classes because its chemically inert composition and high density make it impervious to stains and bacteria. The qualities that make soapstone a good choice for chemistry classes are the same qualities that make it good choice for kitchens and bathrooms. The talc found in soapstone is soft to the touch, lending a smooth feeling of dry soap, which is how soapstone got its name. The colors of soapstone are typically medium gray and can have a greenish cast or bluish cast (the greener the slab, the softer it is, so seek out slabs with less of a green cast if you want a harder slab). Soapstone slabs can contain pronounced veining, which is produced by quartz in the stone. Durability is one of soapstone’s top features. It’s unaffected by heat (it was often used for wood-burning stoves from the 1800s that are still functioning today) so you can place your hot pans and pots directly on the surface with no risk. Unlike granite, marble, and quartzite, soapstone is not porous. This means that you can put raw foods on the countertop without worrying about bacteria growth. It never needs sealing and cannot be stained. The talc content is what makes soapstone softer than some other stones, which leads to edges and corners being eased over time. Nicks and scratches may accumulate, but they can be easily rubbed or sanded out or considered part of its patina. Soap and water is all you need. 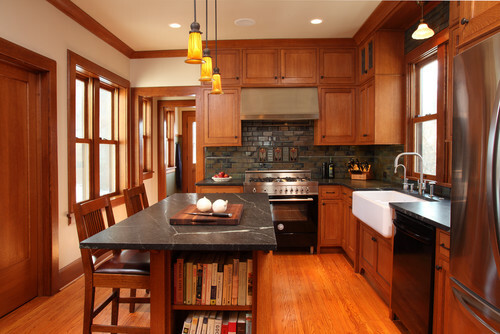 Because of its extreme density, soapstone is naturally resistant to bacteria and germs. Use a bit of mild, pH balanced, clear dish soap when you want a heavier clean than just water. As with marble and granite, do not use any acidic or heavy duty cleaners on your soapstone. Many homeowners like to oil or wax their soapstone once or twice a year. This keeps the color more vibrant and will bring out a charcoal to black color. This is an optional treatment. If you don’t treat your soapstone, it will develop a beautiful patina over the years. Little white scratches on your soapstone countertops can usually just be wiped away with your hand or a bit of mineral oil. If you really cut hard with a knife, or accidentally drop something heavy onto the stone, you may get a nick or scratch that can’t be wiped away with water or oil. In that case, the scratch can be sanded out. Use three sandpaper pads (60, 100, and 220 grit), and lightly sand the spot in a circular motion with each, starting with the lowest grit. Then wipe off any dust and use mineral oil or water to restore the color. It’s that easy. The ageless beauty of soapstone is at home in any design style and will be an asset to any project. 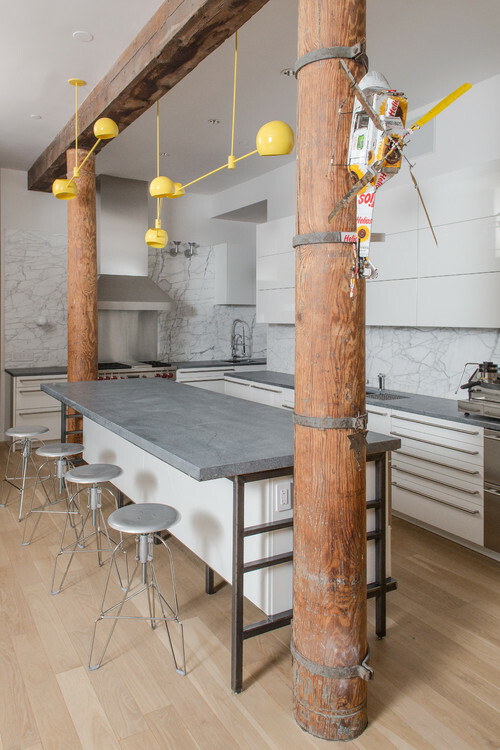 Here’s a look at some beautiful uses of soapstone in kitchens and baths. 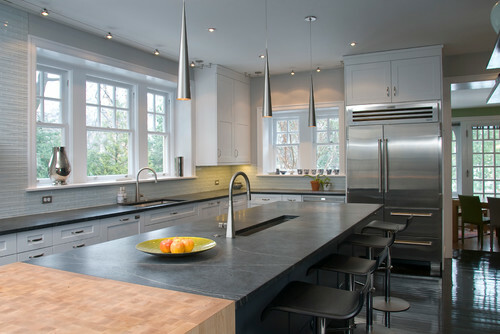 Photo by Full Circle Construction Inc.
Photo by Nolan Painting Inc.
To see even more beautiful soapstone countertops, click over to our Pinterest board! Prestige Marble and Granite offers quality sopastone, in addition to many other beautiful stone varieties. Whatever stone you choose, rest assured our experienced fabricators can handle the job!